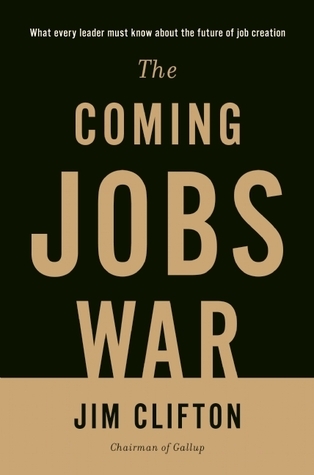 I read this book because current populist, protectionist urges seem like nationalistic competition for globally dwindling jobs, which might be called a "jobs war," and I wondered if Jim Clifton, the leader of Gallup, had unique insight on this phenomenon through the polling and research of his company. Unfortunately, the CEO's self-published book is surprisingly light on evidence, heavy on political proselytizing and advertising for Gallup. Jim Clifton is a slightly more sophisticated Robert Kiyosaki. Even if there are germs of reasonable ideas buried in what Clifton espouses, it's hard to get past his caustic victim-blaming, which is most extreme on healthcare, but present throughout. Clifton sings the praises of entrepreneurs, with a kind of great man delusion blended with borderline eugenic fatalism. Jim Clifton became CEO of Gallup when and because his father, Don Clifton, bought Gallup and installed him as CEO. It's a little hard to take him seriously about individuals' abilities to be totally self-made, or when, with a perfect lack of self-awareness, he goes on to talk about the importance of fixing schools. So the strongest evidence provided that everyone wants to work is that 60% of adults say they do work, or want to work. I have no way of knowing whether "wanting to work" is separated from "wanting to have a decent standard of living." For example, how many people would want to work if they were guaranteed a basic income and social services? I also expected Clifton would address job loss trends due to automation and so on, but there's scarcely a mention. He maintains that people just need to keep making companies, and that will make jobs. He is singularly focused on keeping US GDP higher than China's, never mind per-capita GDP or the strength of the connection between jobs and GDP. Most of these items map onto good advice for companies, but number ten's appearance on the list I think is symptomatic of a "death of science" problem in analysis. Why is "I have a best friend at work" on this list? I suspect the answer is that having a best friend at work is associated with being less likely to quit, and largely independent of other factors, so the item looks good statistically, despite being mostly useless to employees or managers. Sometimes it's possible to see in Clifton's positions what could be genuine caring for people: a desire that everyone reach their full potential. Supporting people's strengths sounds good, and some of the ideas in the book are not all bad. But there are so many bad ideas, it's like picking through a dumpster. I had thought that a book from Gallup might have interesting, relevant data and analysis. I really like the idea of using poll data to better understand the world. I had only known of Gallup's polling operation, not their management consulting side. Unfortunately, based on this book, it seems management consulting dominates their attention. The only people who should read this book are those considering working with Gallup, the better to understand what they would be getting into.